I was planning to go to the gym on Saturday, but I was so busy all week that I did not get to practice my Chinese any, so I stayed home and practiced that all morning and afternoon. After dinner I watched the movie Batman Begins. That was much better than the other Batman movies. Speaking of movies, it looks like Bruce Willis is going to make a movie about the Iraq War which will portray American Soldiers, specifically the Deuce Four, the 1st Battalion, 24th Infantry. Check out my link to Micheal Yon's blog on the right side of this page for more info about this unit. It should be a fantastic movie! At work we have a program to help people speak English better, and I mentor six co-workers in this program. We usually try and get together and do things, such as story telling, to give my people a chance to practice their English. On Sunday night we went to the German restaurant here in Dalian for dinner. Everyone had a good time sampling German food, sampling German-style beer, and practicing their English. It was a fun evening. There was even a band that played later in the evening from the Phillipines. There are a lot of bands from the Phillipines all over asia. We stayed for one set and then called it a night. I hope each and everyone of you have a great Thanksgiving! 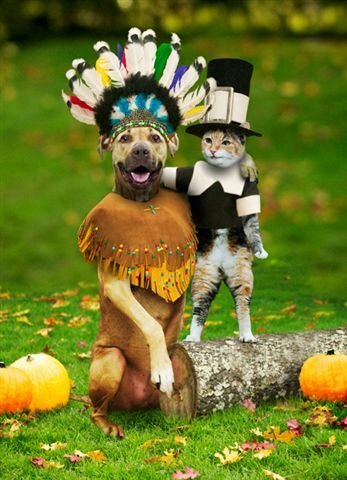 The story of Thanksgiving is here. Enjoy! This last few weeks has been pretty busy, so I have not posted much lately. A lot of changes at work are coming for my group and we have been trying to get ready for those. But enough about work!... On Saturday about forty of us from the office went out to dinner at a place called Samba World, which is suppose to be a Brazilian style buffet. There wasn't too much Brazilian about the place or food. The food was a mix of eastern/western food, but it was pretty good. You would go up to the buffet and get all of the salad, vegetables, soups, desserts you wanted; and servers would come around and serve different types of meats. After Samba World we went to a nightclub called 2046. This is a nightclub that is mostly Chinese since foreigners usually go to other clubs, so a lot of people were curious why I was there. I tried to take my camera into the club, but they wouldn't let me use it. The place was pretty nice... good music, good lighting, and a good crowd. The drink specialty there was pitchers of Johnny Walker Black with white grape juice and ice. Since I don't drink hard liquor I only had beer. 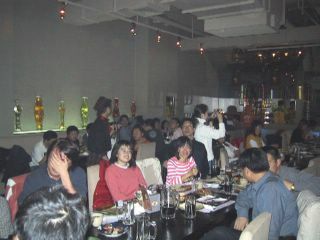 A few people had some Chinese red wine. On Sunday a few of us from the office went to see the new Harry Potter movie. It was really good, but I won't spoil it for anyone by talking about it. We were hoping to go on Saturday, but some company here hired out the theatre for their employees, so we had to wait a day. This weekend was very busy. Pretty much all day Saturday was spent at the gym. On Saturday night I went out with a Chinese lady to a place called I-55 Coffee Cafe. This place was created by an American that lives here in Dalian and has a good variety of sandwiches, coffees, teas, and cheesecakes. We spent several hours chatting and snacking. It was very nice. On Sunday I got together with my boss and his wife, who happen to own several pieces of real estate here in Dalian, to go look for a new place to buy. I really have not decided yet if I am going to buy or rent yet, but it was very interesting. The prices in Dalian (at the moment) range anywhere from around 6kRMB to around 9kRMB per square meter for a finished place. You can also buy places un-finished. The unfinished are just a cement skeleton with plumbing and basic wiring (heat is through hot water pipes). The finished places have flooring and walls, sockets, etc... put in, but you have to be careful of the quality. If it's a big place one might want to buy un-finished and get some high quality finishing work put in, such as gas water heater, etc... Of course, un-finished go for less than finished. Foreigners need to put up 30%, and can finance the rest. Current interest rate is 5% for a home loan. You have to pay a one time 5% property tax and a maintenance fee that ranges anywhere from 1.2RMB per square meter to 3RMB per square meter every month. The properties I looked at ranged in size from 43 square meters (studio) to 150 square meters (2 BR w/den). You also have some kind of form that says you get the property for 7 years (or 70 years... I could not hear which this was exactly), and after that time the goverment can take your property if they wish. Some kind of eminent domain thing since the goverment owns all land in China, and you are just building on it. Sunday night I went out with two Japanese ladies from Dell and we went to an Italian place here called Cafe Igosso. The food was very good and they had a pretty good wine list. After having some Italian food we went a few blocks away to a new German brewhaus that just opened in Dalian a few weeks ago for desert. Desert was apple struttle and German beer. There was a band playing too, so it was a fun way to end to the weekend. The other night I went to Pizza Hut with a friend, and we had a new pizza they have out now... Eel Pizza. Seafood and eel, sprinkled with sesame seeds, and drizzled with eel sauce. It tasted ok, but my stomach was bothering me the next day and today. I am not sure if it was the pizza or not. At least being laid up for the day provided me with some time to practice my Chinese. I wished for more study time and it looks like I got it. As they say, be careful what you wish for. On Saturday I went to the gym again. Did some bicycling and weight lifting. I wanted to go swimming too, but I forgot my swimsuit at home. Oops. I went to lunch with a co-worker afterward and we did a little wandering around some of the shopping centers after lunch and that afternoon we went back to the fitness center to do yoga. This was the first time I have tried yoga. It wasn't too difficult and I think I was a little less sore from my earlier workout the next day due to all of the stretching I got doing yoga, so I will probably keep going back. Tonight I went to dinner with some friends who work for Dell. We went to a little Muslim place near where I live and had all kinds of things to eat... mostly lamb dishes. One of my friends who joined me for dinner was from Canada and the rest were from Japan. One of the girls from Japan was originally from North Korea, but her parents defected to Japan when she was a baby. We all had some interesting discussions about China, and all of the good things and problems we had all encountered here. It was a very pleasant evening.